This being the last unit before the midterm brings us to Post-modernism, something you hear a lot when talking about contemporary art. It can mean a lot of different things, so we are going to focus on some of the key concepts it covers. Appropriation is the act of taking something that already exists out in the world and reusing it in a way that creates new meaning. It covers everything from the image of a Coke bottle as we saw with Andy Warhol to the sampling that is so common in music today. Appropriation today is almost as important as paint was in the 1950s, so we take a bit of time to examine this phenomenon. Self-Referentiality as we break it down today, means “being in the state of referring to oneself”, which may sound like a strange thing for an artwork to do. In the slideshows, I give a mini history lesson of this concept, and end with several examples from contemporary art that we will see again in the second half of the course. I also have a couple videos links for you to explore this idea in popular film. Saussure was a Swiss linguist, and he used what we call structuralism to look at how language works. He said elements of language can be called SIGNS. Every SIGN is a combination of two things: the SIGNIFIER (the image or the sound of the word) and the SIGNIFIED (the mental association we have when we read or hear the word). This is interesting to us, because these ideas have been extended to the visual arts, where elements of pictures are seen as signifiers, and to understand the work, we must decode what is signified. Roland Barthes was one of a group of French philosophers known to us as post-structuralism. They took the ideas of Saussure and applied them in new and interesting ways. One of Barthe’s ideas was to take the idea of the SIGN-SIGNIFIER-SIGNIFIED, and to apply it to the concept of Myths. He explained how additional meaning is culturally heaped upon certain signs in order to elevate them to the status of myth. He uses wine in French society as one example. Wine to the French is much more than just an alcoholic beverage. Even we as Americans have our own perceptions and stereotypes associated with the French and Wine, don’t we? In class we follow the example of the American flag as a myth, and look at many of the places where the American flag shows up in our semester. We will read this text, also by Roland Barthes, which examines how we are to read a work of art. He argues that it is the reader of a novel, or the viewer of a painting, who gets to decide what the true meaning in the work is. The lesson plan is a little different this week, so be sure to check out all the material in order to plan ahead. There is no chapter from the book this week, but the reading is one of the tougher ones to get through so don’t leave it until the last minute. Also the discussion forum comes with it’s own material, so make sure to start digesting that section well before the posting deadline. It’s a little more ambitious of a question this time, and there’s a lot of theory to digest this week, so the first posting is due on Saturday, and the responses, as usual, on Sunday. How do comic books come into play into this weeks lesson? Also, I don’t understand the “joke” from the video semiotics. 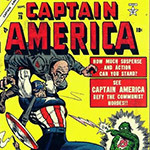 The comic book image above, “Captain America”, I chose not so much for it being a comic book, but for how it relates to the Myth of America ( discussed in the last slideshow). This week, we are almost completely divorced from specific media, because reading signifiers and signified is a technique one can apply to any kind of media : text, painting, sculpture, music, performance. Which joke dont you get? There are two – the grape and the peanut joke.The grape joke “What does a grape say when you step on it?” “Nothing, it just gives out a little whine” is a pun playing on grape juice being “wine” and a “whine” being the noise that registers a complaint. The second joke, about peanuts, you can’t get, because puns don’t make sense once they are translated. Saussure says the relation between signifier and signified in language is arbitrary. Just because we say ‘peanut’ doesn’t mean this combination of letters has any meaning other that what we as English speakers agree it’s going to mean. It could have been called a ‘grapenut’ or a ‘peacock’; as long as we all agree that’s what it’s called, the signifier still points to the signified. Puns play with these conventions by combining words that sound the same but have different meanings. Once we translate them they loose all meaning.